Coming soon to a NetEnt powered online casino near you is Universal Monsters: The Phantom's Curse (formerly known as The Phantom of the Opera). Net Entertainment are taking on Gaston Leroux’s 1909 novel of the same name, although you are probably more familiar with it as Andrew Lloyd Webber’s stage musical. The Phantom's Curse slot machine is the kind of big name title that NetEnt likes to develop; players can expect to get their hands on Universal Monsters: The Phantom's Curse slot in late July. We’ve had a look at it beforehand, though, and we’re able to give you an inside-look at what to expect via our Universal Monsters: The Phantom's Curse slot review. So, without further ado, what can you expect when the The Phantom's Curse slot appears in online casinos this summer? NetEnt (former Net Entertainment) loves the big names, and musicals don’t come any bigger than The Phantom's Curse; you know, aside from maybe Cats or Moulin Rouge. The Scandinavian software developer has chosen to be rather predictable when it comes to The Phantom's Curse slot graphics. Expect to find plenty of paraphernalia as imagery on the reels, including handheld mirrors, ruby encrusted rings, and of course, the title characters themselves. Players will note that The Phantom's Curse online slot contains the famous mask, and the traditional playing card symbols. Speaking of symbols, these appear mildly animated in The Phantom's Curse (The Phantom of the Opera) slot, and stacked no less. Other animated aspects of this slot machine game include cut-scenes whenever a special feature happens to be triggered in the game. In truth, it shouldn’t really matter how animated this slot machine happens to be, the audio, special features and title alone will make this new release appealing to slot fans across the net. The Phantom's Curse slot game is played over a total of 5 reels and 40 paylines. As is becoming more common with NetEnt developed slots, players are not going to be able to alter the paylines in the game. They can, however, adjust the value of their coins and the number of coins they wish to stake per line. 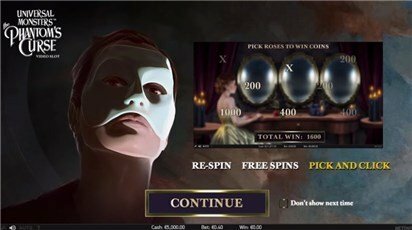 Despite the 40 lines, players are going to get a 2-for-1 deal on paylines, so expect wagers to range from 20p per spin, up to £200 per spin in all. There is a The Phantom's Curse jackpot to be won, but it is non-progressive. 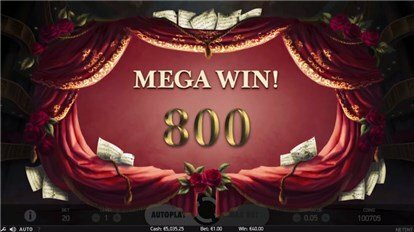 Given the sheer number of special features in the slot, NetEnt have decided to be a little on the cheap side with this jackpot. The most players can hope to pocket is around about max. 200x their total bet per line. Players are going to find plenty of The Phantom's Curse slot bonuses up for grabs in this game, including a nifty feature which allows you to win in both directions. This means that wins can come from combinations running from right to left, as well as the more predictable left to right. Wild symbols take on the shape of the masked phantom symbol. When this icon appears, it can substitute for all other symbols in the slot machine game, except for the scatter icon. Scatter icons appear as chandeliers. These scatters can only show up on the first, third and fifth reels of the slot. Landing the chandelier scatter on the three aforementioned reels at the same time during a single spin will trigger a free games bonus round. There is no shortage of bonus triggering symbols, either. The stacked phantom symbol can trigger an instant win bonus round if it lands fully stacked on the first reel, with a fully stacked Christine on the fifth reel. Players can also trigger a re-spin bonus if they land the stacked phantom on the first reel and the stacked mask icon on the fifth reel. First, let’s look at The Phantom's Curse’s free spins bonus round. Players will note that a chandelier hangs from above the ceiling and that ropes tie it to each of the five reels. When the phantom lands on each reel, he will sever one of the ropes. As he does so, it is possible to occasionally land stacked wilds on those reels for all subsequent spins. Players will keep pocketing free spins until all 5 ropes have been severed by the phantom. There is another major Phantom's Curse bonus game in the form of an instant win bonus. This is effectively a click and win game, but one spread over two tiers. 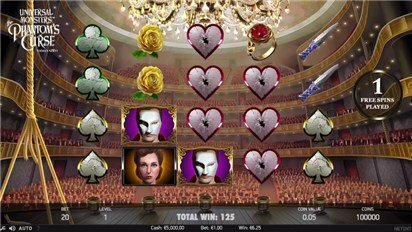 In the first part of the bonus, players must select 1 of 8 roses displayed on the screen to pocket instant cash prizes. In the second, they must select 1 of 3 mirrors to bag a multiplier which could be worth as much as 3x the amount you won in the previous stage. A final Phantom's Curse bonus game offers a re-spin feature. In this feature, the stacked phantom and mask symbols which players landed on the first and fifth reels to trigger the bonus will become stacked wilds and remain sticky for a single re-spin. Universal Monsters: The Phantom's Curse video slot is scheduled to launch at the end of July and will be available at all good NetEnt casinos on the net. Given the number of casinos which offer NetEnt software, expect it to be available everywhere. Moreover, a few casinos will probably house the slot a week or so early as an exclusive, and it would not be uncommon to findhantom's Curse slot bonuses and promotions throughout the launch week.